Marion is a truly talented artist who produces contemporary handmade ceramic bowls and jugs from her studio near Oxford. For over 25 years, Marion has been taking inspiration from the changing texture, colour and movement in the landscapes that surround her and uses oxides and glazes to achieve a spontaneous and individual finish to her pieces. 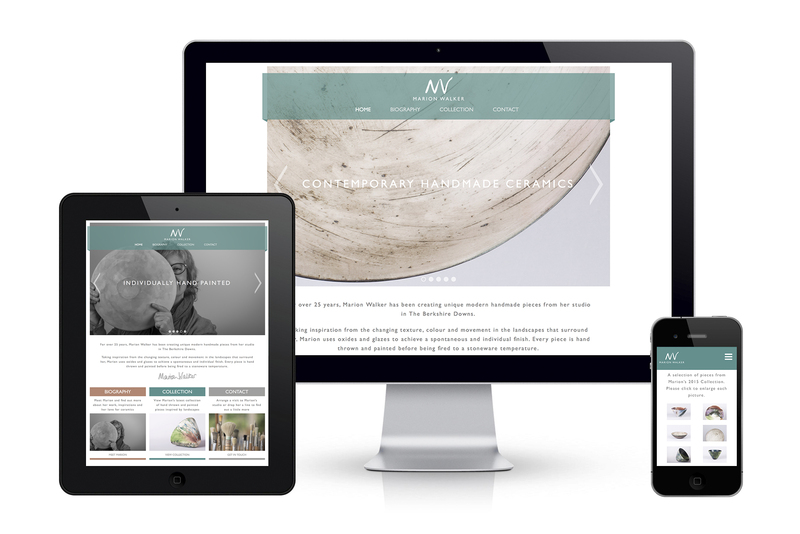 Marion’s brief was simple – to beautifully capture her work photographically and present it online with a simple and contemporary brand that reflects her personality, character and love of ceramics. I visited Marion at her studio in the Berkshire Downs to capture her at work and then took a selection of pieces to photograph in the studio. Her logo was created from her signature as well as her ‘MW’ symbol that she etches into the bottom of her pieces. In addition, a set of postcards with varying images from the photoshoots were created for Marion to give out at shows or simply send to customers and friends.